The bed and column - the spine of the machine. The basic design revolves around bolted/dowelled together sections. 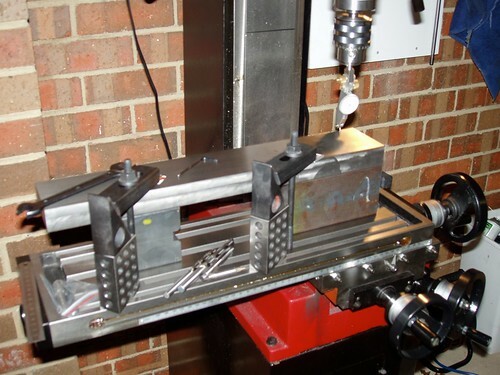 You can see there are no dowells on the sub column which is attached in such a way as the bolts can be loosened so the column can be adjusted back and forward. The column proper bolts to the front face of this and can be adjusted side to side. In this way I hope to be able to adjust the column square to the table. Here is a pic taken while surface grinding the front spacer, rear spacer and lower column parallel in one setting - this will ensure that when the two cheek plates are bolted in place there will be a clean, stress free bed. 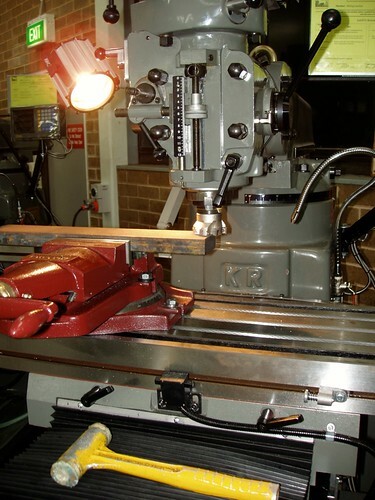 The bed cheek plates were too long (470mm) for my X3 so I am using the King Rich at the local college - a monster of a machine - 1/3 as big again as a Bridgeport. Here I am facing in preparation for grinding. 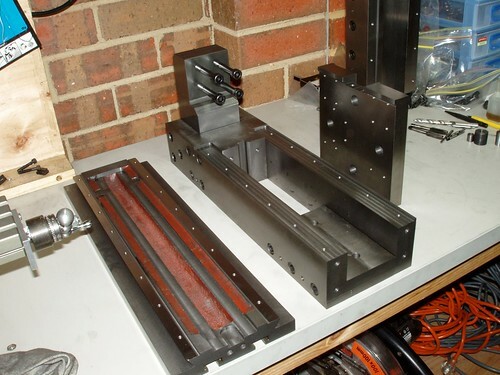 Parts all ground on their mating faces, and in the process of being setup on the mill to drill, tap and dowell the cheekplate to the spacer blocks. You'll notice that the space blocks still have raw lower surfaces. 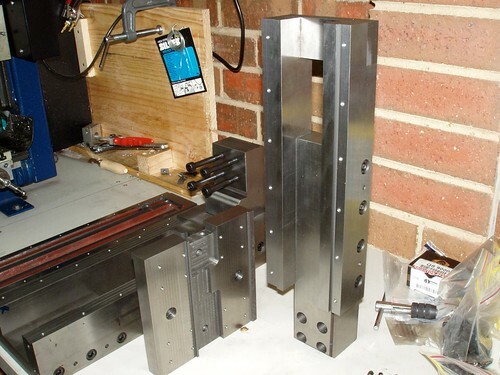 When assembly is complete the whole shebang will be machined all over to final dimensions. The bolts are M10x40mm SHCS and the dowells are 6mm. 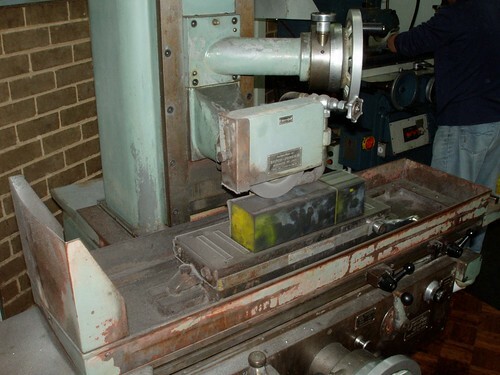 Everything is clamped, drilled, dowelled and tapped on the mill whilst set up to ensure alignment. The finished product! You can see here all of the mounting holes for the rails have been drilled and tapped and column base has been bolted in. 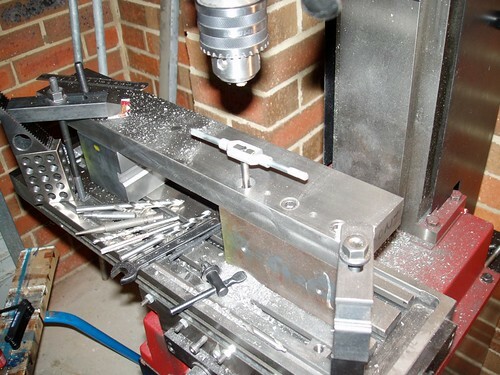 This shot also shows the Y-Axis side of the carriage plate and the underside of the table. From the other side we can see the column constructed using the same methodology and the X-Axis side of the carriage plate.